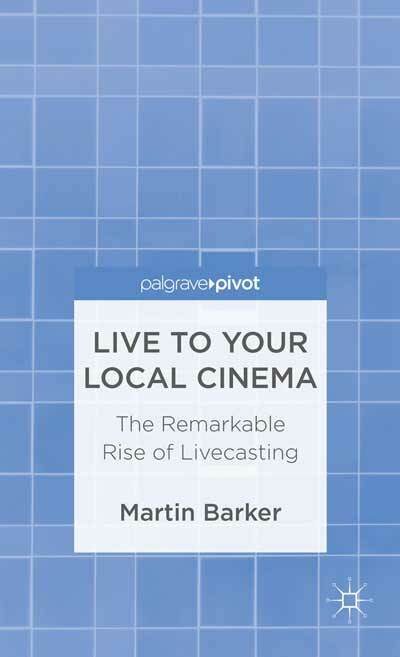 The summer reading continues on, and next on the list is Martin Barker’s Live to Your Local Cinema: The Remarkable Rise of Livecasting (Palgrave Pivot, 2013). This is the first – and as far as I know still the only – book-length work on the growing phenomenon of live theatre broadcasting, and although it is a short one it still manages to cover considerable ground in its 93 pages. Barker is a media studies specialist, with particular expertise in the study of film audiences, and one of the biggest contributions of his book makes is to orient the many questions surrounding theatre broadcasting towards those audiences and their experiences in the cinema. He does so through the collection and analysis of nearly 650 audience questionnaires, completed by attendees at theatre broadcasts at the Picturehouse cinema chain in 2009. In the process he also surveys some of the most relevant research on liveness and mediation in the performing arts, and he raises a series of pertinent (though as yet unanswered) questions about where theatre broadcasting is headed and what this might mean for audience experience. For a reader like myself, one of the most interesting things about Barker’s perspective is its orientation towards film rather than theatre studies. Much of the conversation I’ve been a part of so far focuses almost entirely on how live broadcasting is changing theatre and theatre-going, but Barker’s work shows us how it is significantly affecting cinema culture as well. His first chapter offers a brief history of the rise of digital cinema in the early 2000s and then ‘alternative content’ – aka ‘event cinema’ – shortly thereafter, leading to assertions by the end of the decade that ‘Cinema is fast becoming a multi-arts venue’ (8). In Chapter 2 he continues with a look at the emerging aesthetics of theatre and opera broadcasting, one genre in the growing range of event cinema offerings, and he illustrates, with a faint whiff of disappointment, how approaches to filming and editing tend to be ‘cautious’ (21) and geared towards showing cinema audiences that ‘we are watching a stage’ (16). Although what he calls ‘cinematic flourishes’ or ‘bravura moments’ do appear in most broadcasts, they are used sparingly to punctuate what is on the whole a ‘transparent, unobtrusive, and invisible’ style (15-17). For me, some of Barker’s observations came as a useful surprise; I typically find myself longing for the (very) wide-shot and getting frustrated with what I consider constraining close ups, while he notes that the very idea of ‘close ups’ in theatre broadcasting should remain in quote marks since such shots ‘will almost always include torso and arms. Extreme close-ups are unknown here’ (18). Not all close ups are made equally, I’ve learned. From Chapter 3 onwards Barker gets down to the nitty gritty of analysing audience data and thinking through which aspects of live broadcasts cinema audiences respond to most strongly. While some work has already been done on the demographics and perceptions of broadcast audiences, most notably by NESTA, Barker rightly points out that such research has been more focused on the economic viability of live broadcasting and has tended to overlook the question of audience ‘experiences per se’ (25). Barker’s own research attempts to remedy this lack: after attending briefly to demographics (above all, theatre broadcast audiences tend to be older than typical cinema audiences, he tells us), he goes on to consider what he calls ‘audience pleasures and meanings’, namely ‘the value of localness’ and the ‘powerful sense of participating in the occasion’ (30-2). This emphasis on locality, eventness, and immediacy prompts him to survey, in Chapter 4, the ways in which academics from theatre, television, music, film, comedy, and sports studies conceive of liveness and live experience (to put it briefly: as with the close up, we are not united). While pretty much everyone puts a premium on ‘simultaneity’ (aside from music studies, to a certain extent), Barker suggests that the value of other factors such as ‘bodily co-presence’, ‘experienced risk’, ‘immediacy/spectatorial control’, and ‘sense of place’ vary across the disciplines. His quick summary doesn’t always convince or satisfy me (I don’t agree, for instance, that ‘a sense of place and locality … is largely ignored in theatre thinking’) (57-8), but still the survey is very helpful in challenging readers to look at these thorny issues across different artistic and entertainment forms, rather than always sticking to home territory. And his concluding remarks about what he calls ‘virtual performance studies’, i.e. varieties of digital art and performance, really struck me as important. Here he identifies how ‘liveness’ functions ‘not [as] a descriptive or normative concept, but [as] a tool and a goal. Its question appears to be not whether liveness is present, but how can we make people feel that it is?’ (58). Such a proposition – that liveness may in fact be as much a kind of feeling as a particular geographical or temporal relationship – took me back to Philip Auslander’s categories of ‘liveness’ in his landmark book, and my own musings whether or not the power of liveness is down to its ability to make us feel ‘a-live’, and vividly part of something. One very effective way of doing this is through temporal and/or geographical co-presence with the event itself, but can the feeling be just as strong through temporal and/or geographical co-presence with other things, namely an audience or community? In his discussion of TV studies, Barker suggests that liveness can be created (or, more cynically, constructed) through the insertion of human reaction into editing sequences (47). Similarly, in his discussion of music studies, he notes how ‘The thing that makes the difference’ is ‘a sense of occasion, of audience collectivity, of ritual’ (53), and in comedy studies how ‘“liveness” can be as much about belonging to a locality and community as about physical presence per se’ (55). His final discussion of sports studies goes furthest of all; reflecting on the common practice of gathering in pubs to watch televised broadcasts of games, Barker observes how audiences may ‘generate a cultural context which they can then own and treat as “live”’ (57). Liveness, in this way, becomes much more about engagement, eventness, and feeling: ‘being there’ might be one powerful way of producing such experience, but what Barker’s survey begins to suggest is that there is more than one ‘there’. Chapter 5 continues in this vein, exploring how cinema audiences at theatre broadcasts characterize liveness themselves, and the conclusion is largely the same: ‘audiences communally produce new ways of “doing liveness”’ (71). Different kinds of audience members might want different things (Barker divides his respondents into what he calls ‘immersives’ and ‘experts’ (67)), but he suggests that for everyone part of the value and enjoyment of the broadcasts is the opportunity to celebrate not only the art on display but also the audience experiencing it together. They are ‘living’ such experiences, he suggests, and he further posits that ‘Thinking about the liveness of such events in this way would entail a wholesale re-theorisation of what we mean and intend by the concept’ (72). Ultimately, that re-theorisation is not part of the scope of Barker’s study, which he characterizes at the outset as ‘a “come-on” to other researchers’ in the field rather than an exhaustive and definitive response (viii). In his final chapter he outlines a series of possible questions that those researchers might take up, but his invitation always remains an open and exploratory one. In this spirited and lively book he casts his net wide and brings together initial data, possibilities, and questions that should interest anyone working in this field, be they cultural theorists, sociologists, geographers, media specialists, or indeed performance scholars. As this review and response no doubt shows, for me his most exciting points are about the experiential and affective dimensions of liveness. But for others – who knows?